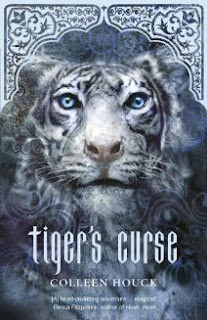 From Oregon to the jungles of India, Tiger's Curse proves to be a phenomenal and captivating fantasy in which Colleen Houck immerses readers in Indian culture. Houck's beautifully written story captures India in such a way that everyone will feel as if they'd experienced the language, cuisine, and mythological tales first-hand! Kelsey is fresh out of high school and preparing to face a future of work and college. When a temporary job at a traveling circus turns into a cross country trip to oversee the care of a beautiful white tiger, Kelsey's future becomes filled with more adventure than she bargained for. The white tiger is revealed to be a 300 year old Indian prince in need of help to break the curse that keeps him and his younger brother, Kishan, tigers. Kelsey's connection with the tiger, Ren, is adorable and would make any animal-lover proud, but with Ren, the man, it's even stronger, and certainly steamier. Houck's ability to write such an epic fantasy while keeping close to reality is astounding. Tiger's Curse is written at a pace that allows one to bask in the adventure while creating an unbreakable bond with the few main characters, Kelsey, Ren, Kishan, and Mr. Kadam. It's a treat to journey with Kelsey as she puts the welfare of others before herself. Her selfless character surely endears her to the many readers of this series! Tiger's Curse, by Colleen Houck from Sterling Publishing on Vimeo. I have heard so many wonderful things about this series and can't wait to dive into it soon. Thanks for your thoughts!